Welcome to the Saintillan Research Group! Our research centers on the study of fundamental fluid mechanics problems involving complex fluids and complex flows, typically on small scales. We use a combination of modeling, theory, and numerical simulations to study the dynamics and properties of flows involving a microstructure (such as particles, macromolecules, swimming micro-organisms, biopolymers) suspended in and interacting with a viscous fluid, as arise in many biophysical, environmental, and technological processes. We are particularly interested in fluid flow problems in which complexity arises from: multiphysics phenomena in which the interactions of various effects (mechanical, electric, chemical, or thermal) lead to complex dynamics; the effects of long-ranged hydrodynamic interactions on fluctuations and pattern formation; the coupling of a large number of degrees of freedom (such as particle configurations). Many of our current problems of interest are motivated by simple experiments, biological phenomena, or engineering applications, and their solution often involves applied mathematics, large-scale computation, and comparisons to experimental data. More details on our recent work can be found on our research page and in our publications. 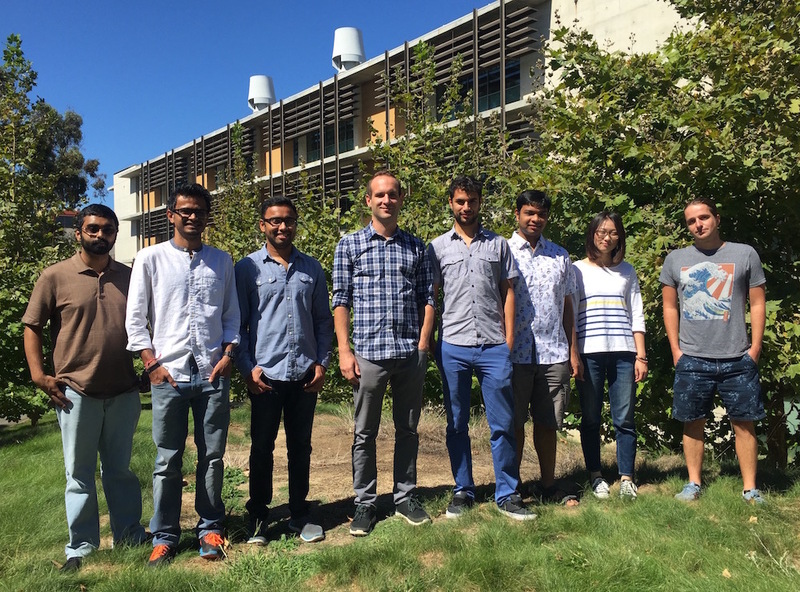 Left to right: Piyush Prakash, Achal Mahajan, Debasish Das, David Saintillan, Roberto Alonso-Matilla, Brato Chakrabarti, Yixuan Jia, Maxime Theillard.